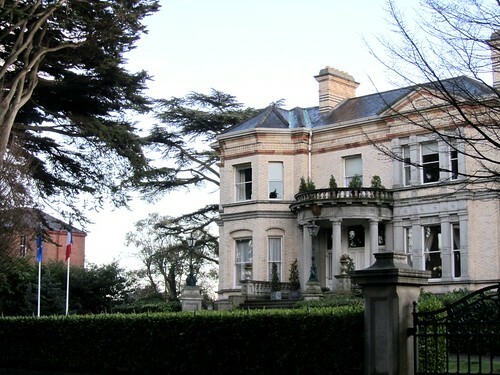 The embassy belt of Dublin lies around Ballsbridge and its environs. Quite pronouncedly, just walk down Ailesbury Road (off Donnybrook) anyday and the majority of the compounds, both left and right of the road, would bear flags of one country or another. This photo of an ambassador’s mansion may not be particularly clear (it was a still day, with nary a gust of wind to fly the flags) but look closely – could you guess who lives here? Security measure at the embassies are undoubtedly tight. Just take the American embassy on Elgin Road. It is like a small fortress in its own right. Security gate with guarding policemen, and if I recall my visit there a few years ago correctly, they will only admit someone in accordance to appointment list (no random drop-ins), they will take away your mobile phone/digital equipment (no recording policy inside the embassy) and there are scanners and delayed doors etc. I do wonder how did they do it, when they held election parties in the past, to vet US citizens plus guests in a relatively high number. Can’t be easy.